Marx and Engels. These two bewhiskered Germans and their ideas about class struggle may appear a world away from today’s London, which can often feel more like a playground for the rich than a home to the average worker. But beneath the 21st century veneer of luxury apartments and gold-leaf truffle wagyu burgers, London has a rich revolutionary heritage worth exploring. 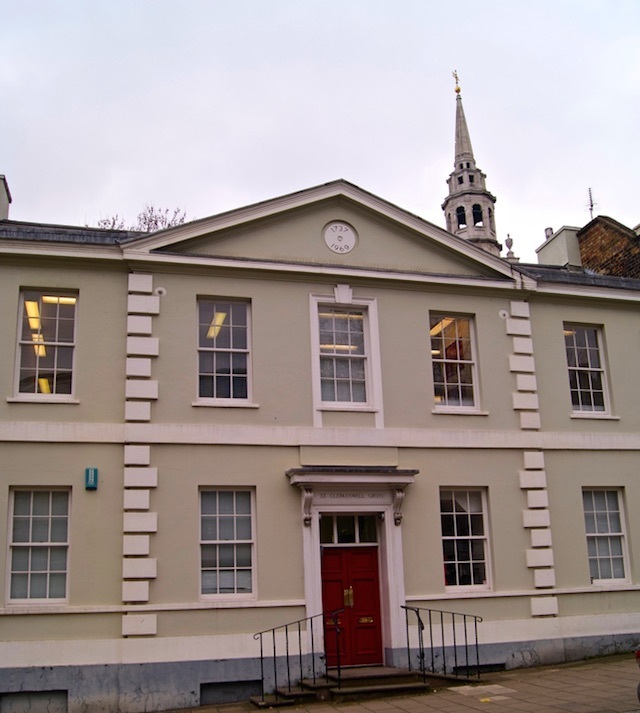 From the grand atrium of the British Museum to the moss-covered headstones of Highgate Cemetery, here Gavin McCrea, author of Mrs Engels, guides us round five London sites with a socialist history. Leaving his native Germany while still a young man, Marx roamed Europe before arriving in London in 1849. Here he continued to roam, moving addresses several times until he died in Hampstead in 1883. A few years after he arrived the British Library opened a new, circular reading room. With three miles of bookcases and 25 miles of shelves, the room provoked huge excitement; when it opened to the public for a special viewing it attracted over 62,000 visitors over just a few days. 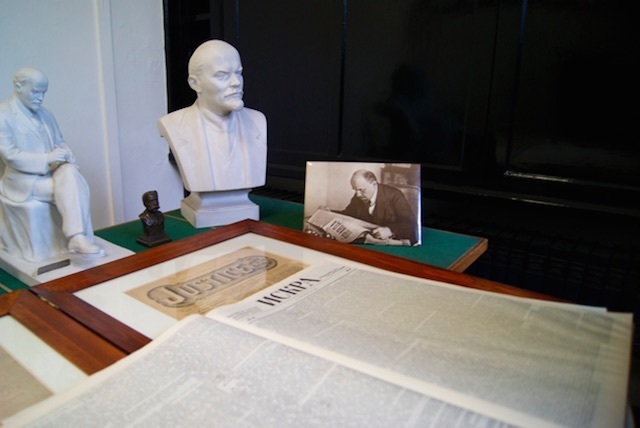 It became one of Marx’s preferred places to write, and it was here that he penned some of his most significant works, including Capital. No longer part of the British Library, the Reading Room was converted into an exhibition space in 1997 during the redevelopment of the British Museum. You can’t go inside now but you can get a sense of its scale by visiting the Great Court. 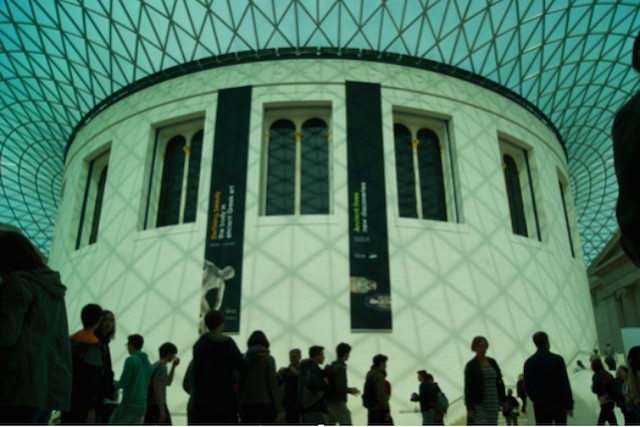 Free entry, open daily 10am-5.30pm. 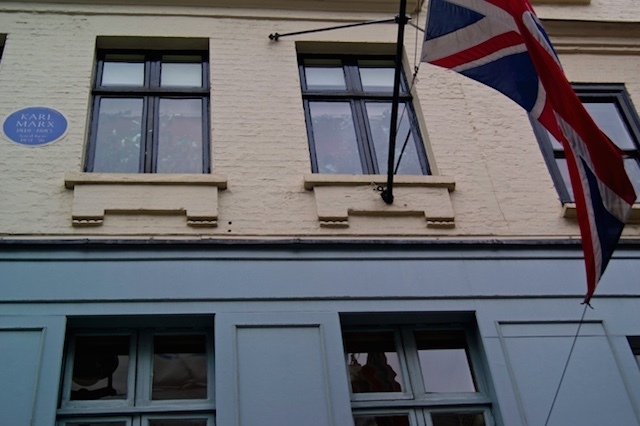 If you look carefully at the sprawling frontage of this Soho dining institution, you can spot a blue plaque commemorating the time that Marx spent living at 28 Dean Street in the 1850s. It was a time of personal tragedy for Marx: three of his children died in those years. Eventually he moved his family — including his aristocratic wife Jenny Von Westphalen and his spirited daughter Eleanor — out of seedy Soho and joined his friend Engels in leafy North London. You can rent the ‘Marx Room’ at Quo Vadis for private functions. If your budget is a bit more working class, the set menu is reasonable enough. Unlike Marx, who struggled to manage his finances for most of his life, Friedrich Engels was the son of a wealthy industrialist and a successful businessman. In his early 20s, his family sent him to Manchester to help manage their textile mill. It was here that Engels formed a relationship with the sisters Mary and Lizzie Burns, two working-class Irishwomen who are credited with helping to open his eyes to the lives of poor slum-dwellers, inspiring him to become a communist, and fuelling a lifelong love of Irish Stew. 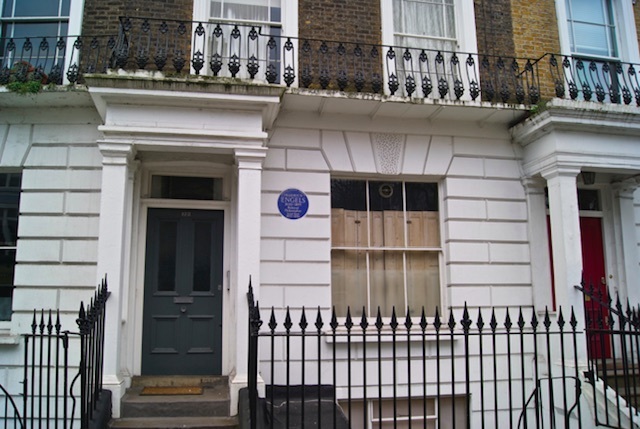 After years of supporting Marx with his work at the factory, Engels finally moved to London with Lizzie in 1870 and established a home at 122 Regent’s Park Road in Primrose Hill. With the Marx family now installed just up the road, there followed a golden period of socialist thought, punctuated by frequent picnics on Hampstead Heath. The house is marked by a blue plaque. For the full Engels experience, pick up a copy of the Communist Manifesto from the excellent Primrose Hill Bookshop next door and head up Primrose Hill for a panoramic view of London. The real highlight of the building today is the splendid mural in the Reading Area. Titled The Worker of the Future Clearing Away the Chaos of Capitalism, it was painted in 1934 by the 'Red Earl', Viscount Hastings. 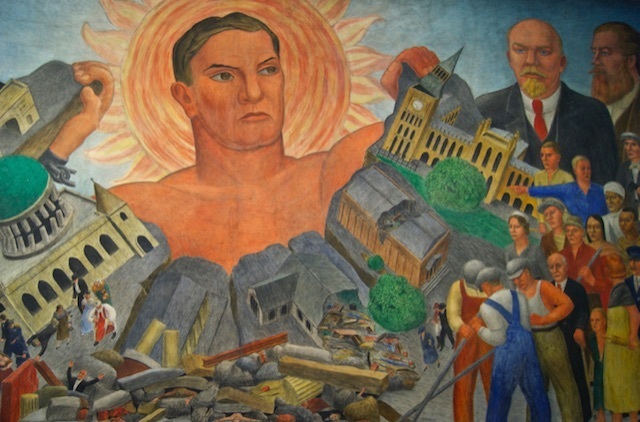 You can see the influence of his teacher Diego Rivera in the style of the mural, which depicts a gigantic, swarthy Welsh miner rising above the ruins of capitalist society, flanked by the leading lights of the socialist movement. 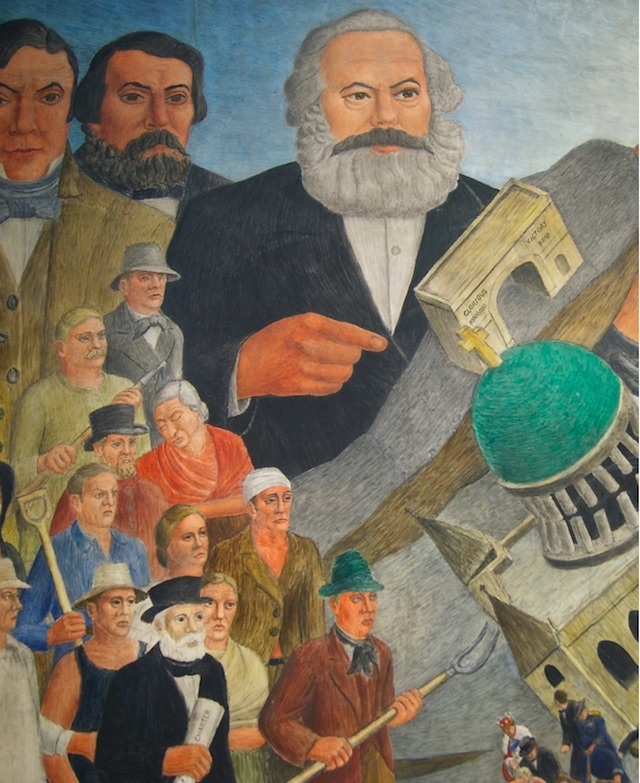 Marx and Engels look on approvingly from the top left hand corner. Opening hours are Monday-Thursday, 12pm-4pm. 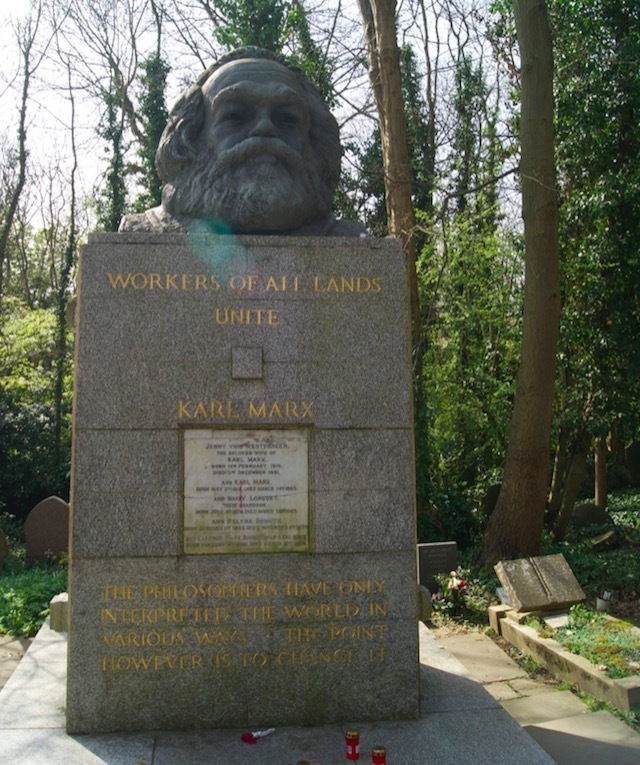 When Marx died in 1883 he was interred in the beautiful Highgate Cemetery, not far from his home. Originally his grave was located in a discreet side plot, but in 1956 the Marx Memorial Fund erected a monument to him featuring an imposing bust by Laurence Bradshaw. Today it’s become a site of pilgrimage for socialists the world over. After his death, Engels continued working for the communist cause, editing the remaining volumes of his friend’s seminal work, Capital. Engels died in 1895 and his ashes were scattered off Beachy Head in East Sussex. Highgate Cemetery is open Monday to Friday, 10am-5pm (last admission 4.30pm). Weekends and public holidays, 11am-5pm (last admission 4.30pm). £4 adults, under 18s free.